Setting out on safari you normally have no idea what to expect, is it going to be a day full of birds and plains game animals, or are you not going to see a hippo splashing about as we pass by one of the dams, or will the day be filled with the Big 5 – From Lion to Leopard? Well, that’s part of what makes a game drive on Kapama Private Game Reserve so special. 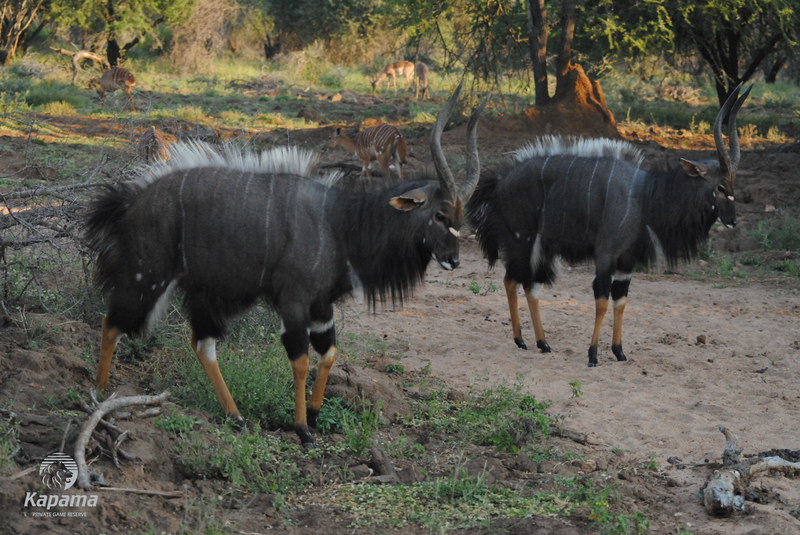 Especially when you come across two Nyala bulls having a display of dominance trying to impress the females. 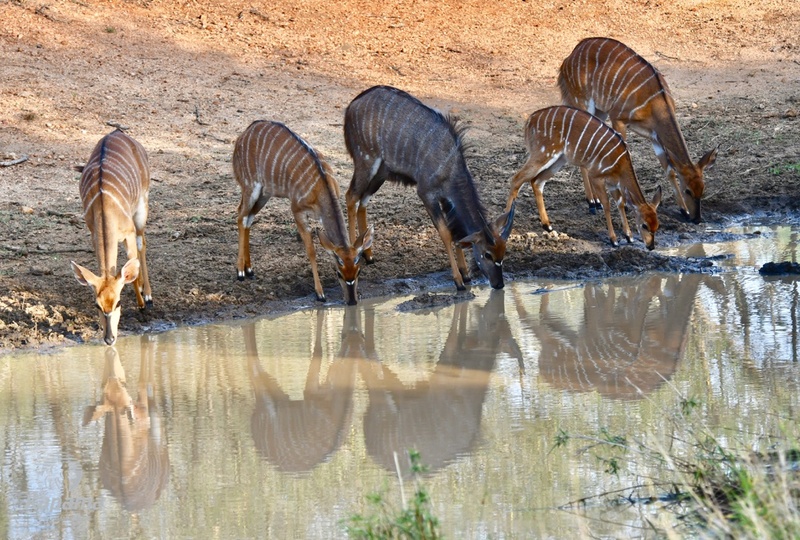 We saw a few Nyala off in the distance and I decided to give my guests a closer look. As we approached a herd of Nyala, two of the larger males were like boxers in a ring, circling each other showing off their size. This boxing dance is all due to dominance to get a potential mate. 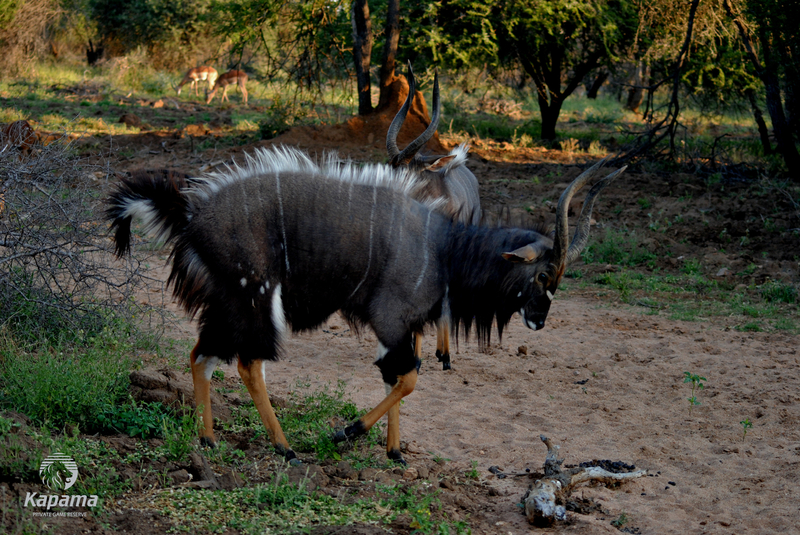 Unlike other antelope, Nyala bulls have a rather strange way of fighting. It looks more like a slow-motion waltz than it does a fight. They circle each other, with their faces trained on the ground but still keeping a beady eye on their opponent. They circle each other broadside in a lateral display, attempting to make themselves appear as big as possible. They fluff up their tails and the dorsal manes on their back, whilst arching their heads forward with horns held high. It is in this rather contorted posture that they then deliberately circle one another, slowly high stepping their bright yellow/orangey legs as they go. This is often done in the presence of females and in the hope that these potential mating partners will be watching to see who comes out on top. Typically the male who loses will drop his mane and wander off to groom or feed in a rather sheepish manner, appearing to have forgotten about the fight altogether. The winner will keep his hair puffed up for a while longer, making sure everyone is aware of who won the fight-dance. It ’s this particular male that will then be awarded the mating rights. Seeing this kind of behaviour is always special as it doesn’t happen very often, and just to see the beautiful colours being displayed is incredible. That is why I love each and every game drive on Kapama. Yes, the Big 5 are magnificent animals to see in the wilderness, but on our search to find these bucket list African wonders, it is always nice to take a moment and marvel at all creatures in the animal kingdom. They can teach so much about life. In this case, nature shows us that not everything has to end in a big fight or argument; there are other ways to solve problems and in this case, it was… A Dance.